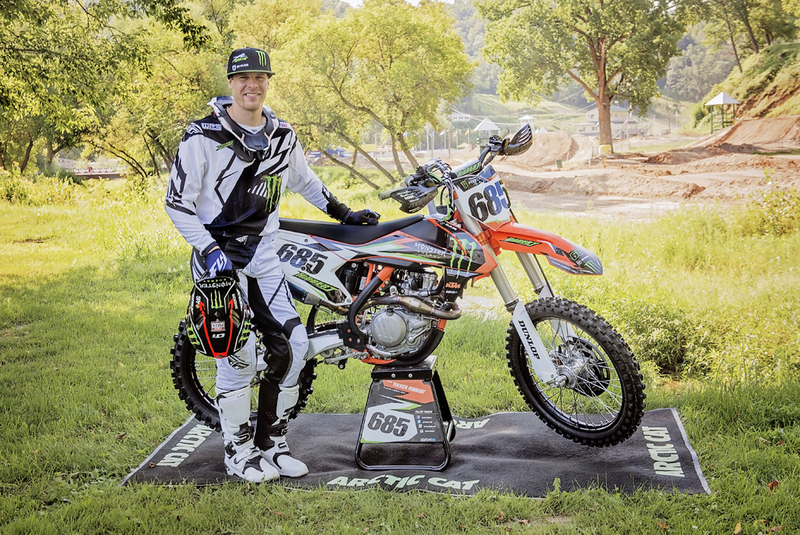 Snowmobile snocross champion, Tucker Hibbert, will line-up against the world’s best motocross racers Saturday at the Pro Motocross Championship’s Ironman National in Crawfordsville, Ind. It’ll mark the crossover athlete’s one and only pro motocross event of the summer. No stranger to two wheels, Hibbert has raced both snocross and motocross at professional level since 2000. Early in his career, he took a brief break from snocross to add being a top-10 Supercross rider to his long list of accomplishments. Now, with his focus back on snocross, he’s won an unprecedented 108 pro national events, 13 X Games medals, nine national titles and two world championships. Hibbert had five pro motocross events on his schedule this summer but an ankle injury sustained in June sidelined him from racing until now. Look for Hibbert at the Ironman National on the no. 685 KTM in the 450-class. Racing action from Indiana will be streamed live on promotocross.com. Additionally, fans can watch the first motos on MavTV from 1 to 3 p.m. ET and the second motos on NBCSN beginning at 11:30 p.m. ET. “This summer didn’t play out how I hoped but I’m healthy and ready to race. I made the switch to KTM and felt comfortable on the bike right away. Early June, I knew I was ready to race so I signed-up for Budds Creek. A couple days later, I came up short on a big jump and broke my ankle. It was a bummer but I knew if I worked hard I could still get in at least one national before the end of the summer. People ask me all the time why I race motocross but it’s just a part of who I am. I love to ride and know it makes me an all-around better athlete. Snocross and motocross aren’t as similar as people might think. Snocross is more like Supercross – short, intense races. Motocross is a whole different animal. Add the heat, for a guy like me who’s used to racing in sub-zero temps, and it’s really tough. What: Hibbert will ride the Ironman National track and be available for interviews. When: Thursday, August 20 from 1 to 3 p.m.
Where: Ironman National Raceway – 1389 W 200 S Crawfordsville, Ind. For more information, contact MX Sports’ Media Manager Brandon Short at 949-365-5750 or Brandon@mxsports.com.